Air Traffic Services | Aeronautical Radio of Thailand LTD.
Aerothai provides Air Traffic Control Services in accordance with international standards and regulations as well as providing Flight Information Services and Alerting Services to ensure safe, convenient and expeditious air travel. The role also includes coordinating search and rescue operations. 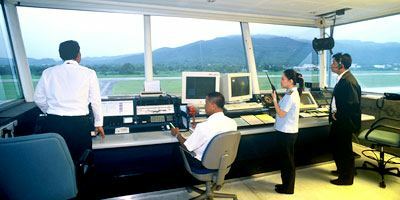 Aerodrome and Approach Control Services are provided at all commercial airports throughout Thailand within a 30 nautcal mile radius from each airport and at altitudes 11,000 feet and below. 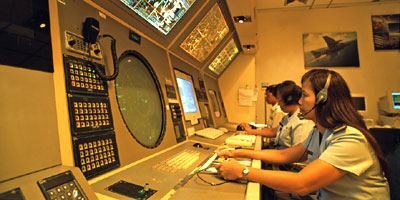 Beyond these limites, the responsibility is transferred to the Area Control Services which covers the whole of Thai airspace or Bangkok Flight Information Region as well as the airspace over part of the South China Sea west of Cambodia at an altitude of 13,500 feet up to FL 460 (46,000 feet). However, for Bangkok International Airport, the coverage area is extended to 50 nautical miles radius and an altitude of 16,000 feet and below. This is due to the high traffic volume and the need to be able to transfer air traffic directly to nearby airports, such as U-Tapao and Kampangsaen, without having to pass through Area Control Center. AEROTHAI provides Air Traffic Services to both civilian and military flights using Radar System and Automatic Dependent Surveillance System, or ADS. Both systems can provide aircraft information such as call sign, position, heading and altitude as welll as other information necessary for effective Air Traffic Control Operations. The Company's aeronautical infrastructure comprises a network of VHF radio systems for communicating with commercial aircraft and UHF radio systems for military aircraft. The base station is at the Head Office in Bangkok with relay stations located around the country enabling continuous communication with all aircraft at an altitude of 5,500 feet and above. 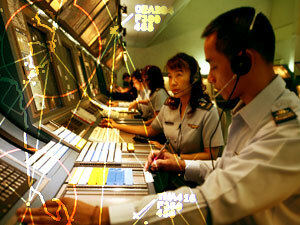 Furthermore, there are communication networks that link all the Air Traffic Control facilities within the country to the Military Air Defense Unit and the adjacent Flight Information Region, i.e. Singapore, Kuala Lumpur, Yangon, Vientiane, Ho Chi Minh and Phnom Penh. There are also Navigation Aid facilities located at all commercial airports nationwide to provide vital navigational aid for pilots. The Facilities consist of three main elements: first the Non Directional Beacon (NDB) and Doppler Very High Frequency Omni Directional Range (DVOR) indicate the direction to airports for aircraft, second the Distance Measuring Equipment (DME) indicates the distance between aircraft and airport, and third the Instrument Landing System (ILS) indicates the optimum glide slope, which helps land the aircraft at the centerline of the runway.